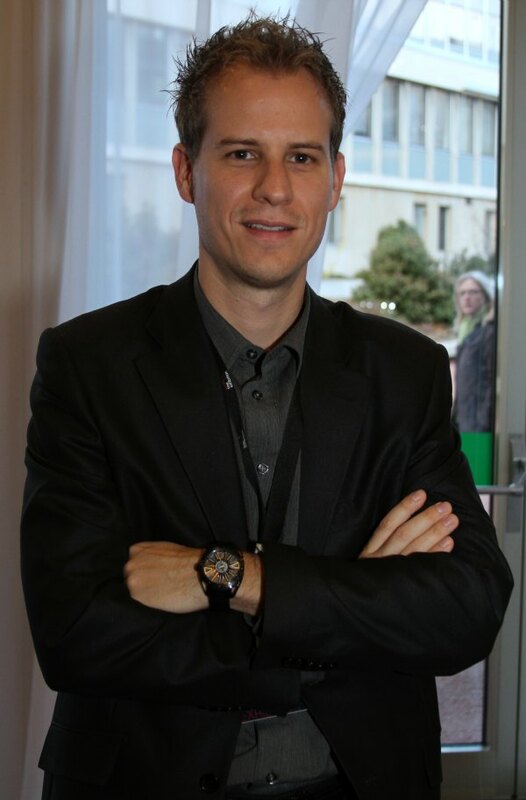 One of the best mechanical watches for 2011 shown at the GTE (Geneva Time Exhibition) was clearly Frederic Jouvenot’s masterfully creative and well-executed Helios watch. 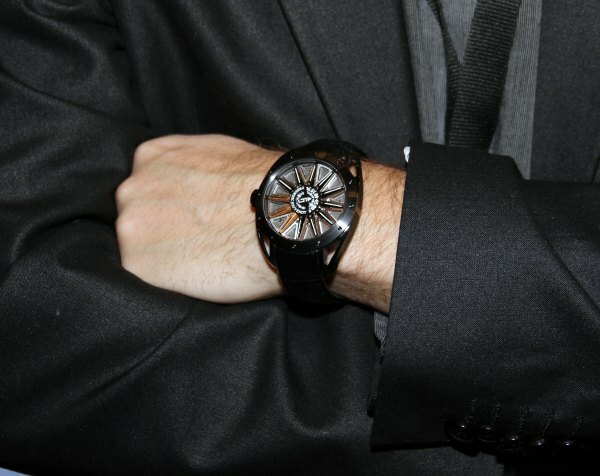 The talented Mr. Jouvenot – a young and ambitious watch maker – was nice enough to show off the watch to me himself. I was dazzled by just how different, yet easy to read it was – and for about 50,000 Swiss Francs you too can have one. An element of the watch that isn’t totally new is the case. Frederic Jouvenot (FJ) debuted this case on his previous watch, the Frederic Jouvenot Automatic Chronograph Evolution. It has a great feel to it being 44mm wide in titanium. It is available in brushed and polished titanium, or in DLC black coated titanium. My choice (and the one on my wrist) is the DLC model – looks awesome with the gold-toned “sunbeams” which are made out of aluminum for strength and weight savings). What impresses me most about the Helios is that in addition to it being an innovative way of telling the time, the design itself has a very good looking presence to it. 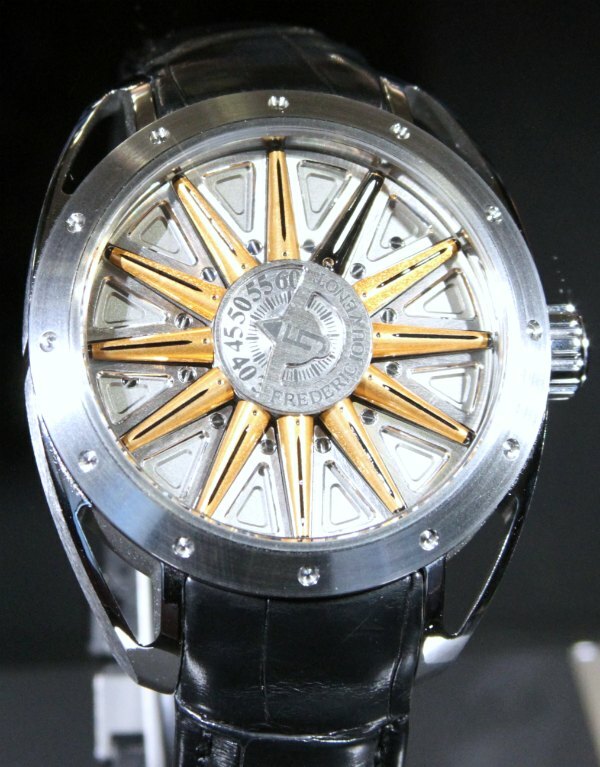 This is one of the most interesting looking unorthodox timepieces when just seeing it on the wrist. 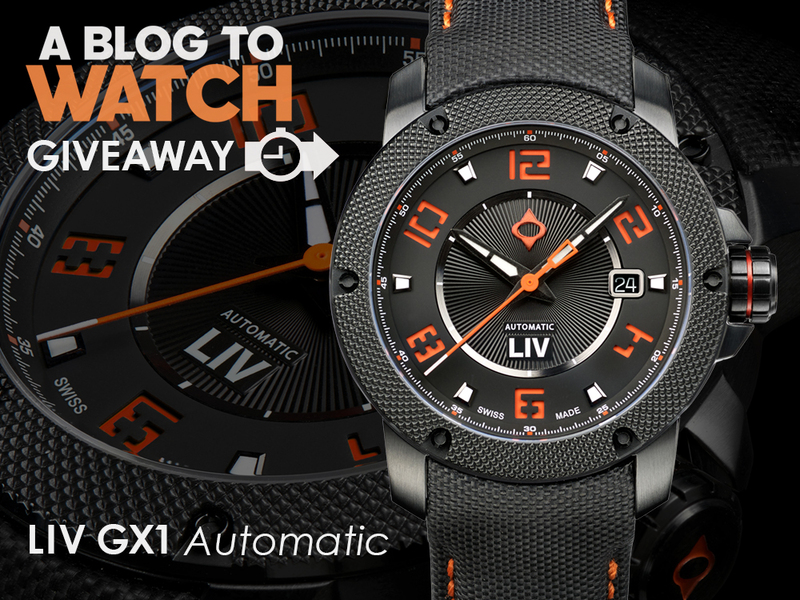 This is thanks to the deep, highly detailed dial that has a beautiful radial symmetry to it. People like to go off on how symmetry isn’t as important as “balance.” There is some truth to that, but a watch like this shows just how powerful good symmetry is. 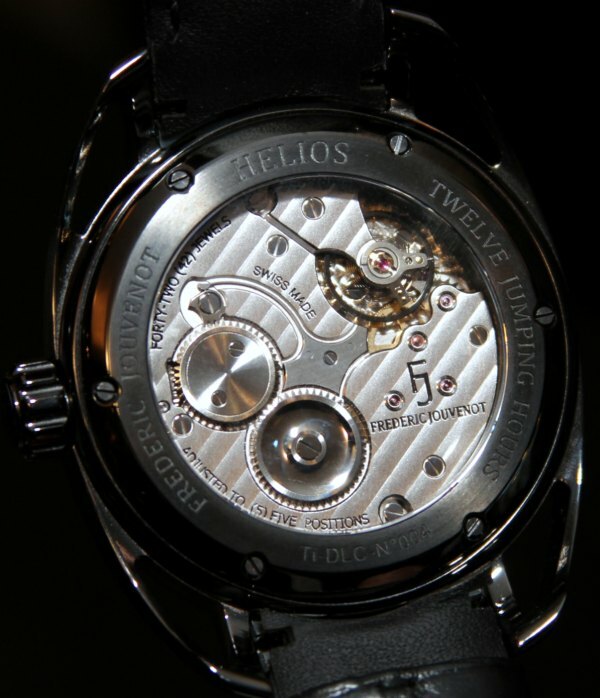 The Helios starts with a manually wound mechanical movement that uses a rotating disc for the minutes and spinning conical cylinders for the time. The movement has a power reserve of 45 hours. The little video I took and posted should help explain exactly how it works. When the cones are flipped over to their gold side, they represent an hour to be counted. 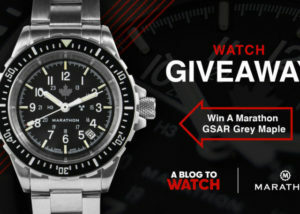 The watch on my wrist for example would be about 11:34. That is because 11 of the cones are gold and the centrally mounted minutes disc is pointed at “34.” See how simple that is. The cones are made of aluminum, and gold colored on one side, while black on the “off” side. As you can see, you can adjust the watch in both directions, and the result is flawless. 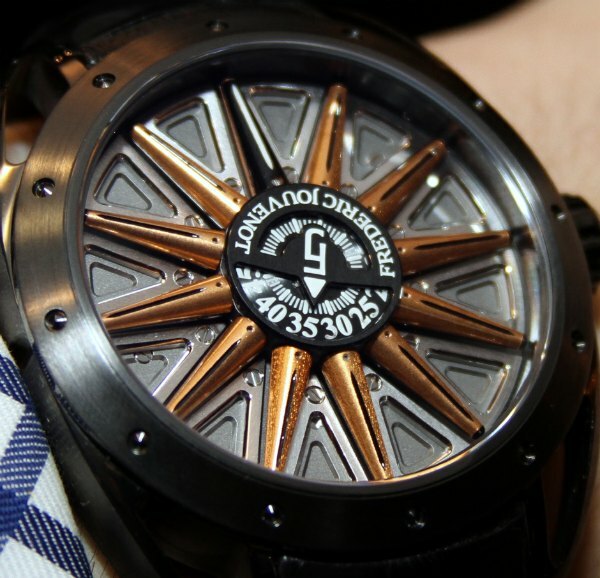 While not the same concept really, the theme is in the same class as the previously discussed Ludovic Ballouard Upside Down watch. 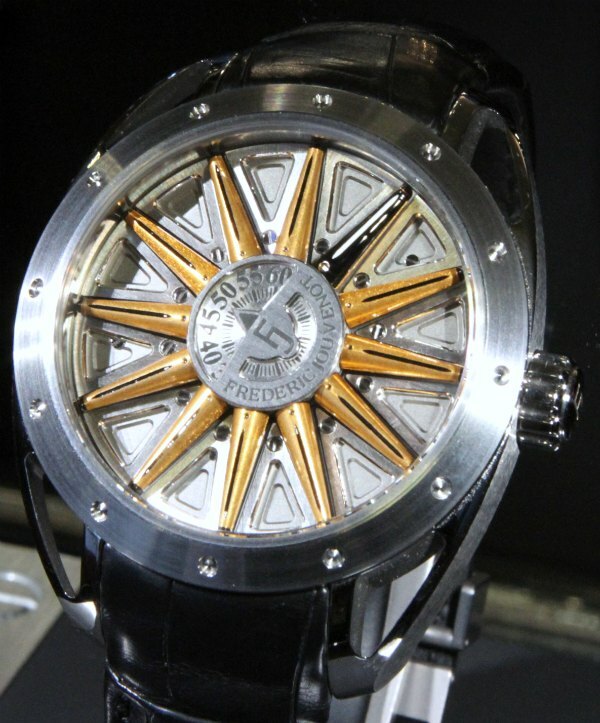 If you are a sun-worshiper I can think of no better watch if want a high-end piece from an independent watch maker. Even then, at a price of 49,860 Swiss Francs, limited to just 144 pieces – the watch isn’t cheap, but in my opinion represents a pretty solid value for what you are getting. Pretty cool. Reminded me more of the rim to a sports car than a sun, but the effect is the same I guess, and thats not a bad thing. I’d probably opt for a colour other than gold tone if one were available, but thats just me – I don’t think the black and gold looks bad, its just not my cup of tea. All the little details in the dial, with the integrated strap and skeletonized lugs make for a very defined look. Very nice and unusual. Also leaves some room for evolution. For example, a model that only “colors” current hour or does minutes differently. 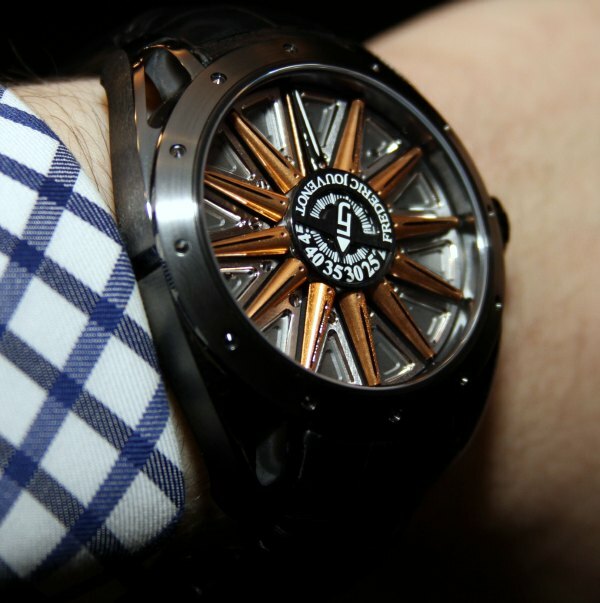 Absolutely love this watch, think it’s a fantastic idea. Not sure if you covered this in the article, but do black cones signify night and gold cones signify day? For instance, is midnight represented by all black cones, and midday represented by all gold cones to give this watch 24 hour aspect? Cool blog in the snack time. Actually I saw this Hands- On watch in Branded watch showroom in chennai. Watch world the name of the showroom they actually doing great with Brands. I loved it. Hope you will also love. If you got time just check them.